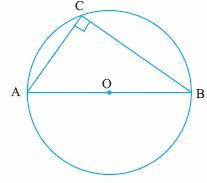 Q 1: Find the angle x.
Q 4: Two circles intersect each other at points A and B. If AP and BQ be the respective diameters, show that PBQ is a straight line. 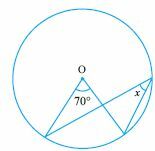 Q 7: Angles in a semicircle is always ____. Q 8: In the figure, PAQ and RAS are straight lines. Show that angPXR = angQYS.